Arizona has six weeks to finalize its plan to deal with looming shortages on the Colorado River. Otherwise, the federal government will step in. Last year, the Bureau of Reclamation pushed states to finish their plans by the end of the month and spell out how they will deal with cuts to their supply of Colorado River water. The Upper Basin states of Colorado, New Mexico, Utah, and Wyoming have already done so. If they don’t finalize their plans by the end of January, the Department of Interior will ask states to recommend actions that it could take before August 2019. That is the soonest Interior would declare a shortage that would lead to cuts in states’ supply of Colorado River water. Number one: Who will sign for Arizona? The board of the Central Arizona Project, which operates the 336-mile canal bringing water from Lake Mead to Maricopa, Pima and Pinal counties in central Arizona, has insisted it should be able to co-sign. It has an elected, 15-member board representing those three counties, and it has set aside $60 million to help pay for the Drought Contingency Plan. Not so fast, says the Arizona Department of Water Resources, which represents the state and is currently the signing designee. Number two: Where will the money come from to help Pinal County farmers? If a shortage is declared on the Colorado River, Arizona will lose at least 512,000 acre-feet of the 2.8 million acre-feet of water it takes from the river each year. One of the groups that stands to lose the most water, and first, is farmers in Pinal County. As drought negotiations lurched through the fall, the question loomed of how to compensate farmers for the water they would lose. For several different reasons, no one could agree. Water might be fluid, but in Arizona, moving it from one place to another is not simply a matter of putting it in a pipe and letting it flow. A ridiculously complex legal framework governs what water can go where and for what and to whom. 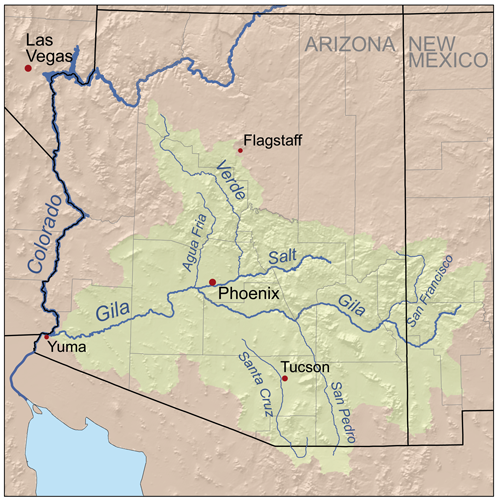 For example, Arizona takes surface water directly from the Colorado River. Much of that is used immediately, but some of it is stored below ground. Not all users are legally allowed to store water underground. Those who do can receive credits to withdraw the same amount of water in the future. This system is so complex that not even the state’s own drought negotiators are clear on how all of this will be worked out. What is clear, however, is that Arizona’s Drought Contingency Plan will require some legislative changes, because part of the way the plan would compensate farmers and other users, including cities and tribes, is through an exchange of credits. Pinal County agricultural districts were hoping that some cities could be persuaded to store some of their water in Pinal County, Orme said. But those cities wanted to be sure they could store water in the Pinal area and still receive credit in their own areas. Arizona’s Water Banking Authority, which holds credits in all areas, could facilitate that exchange, but “that requires some legislation,” Orme said. Another needed law change has to do with a statutory definition called WaterBUD, which is shorthand for “Water that cannot reasonably Be Used Directly.” It essentially prohibits users from taking Colorado River water and storing it underground in order to obtain credits if the water could have been used right away. The mitigation plan put forward in November would require a partial repeal of WaterBUD. Otondo said she would love to see the legislature vote on the Drought Contingency Plan at the beginning of session, in mid-January. “But I just don’t see the language being there and all the details hashed out.” She hoped things would be clearer after Christmas.